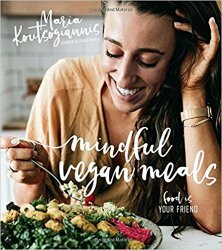 In this fearless cookbook, Maria Koutsogiannis, creator of FoodByMaria, shares the vibrant vegan recipes that paved her way to healing and self-acceptance. Every nutrient-packed recipe marks a milestone for Maria?follow along as she makes delicious discoveries. Mushroom and White Trufe Oil Risotto is a reminder that carbs are not the enemy, Self-Love Buddha Bowl with Baked Falafel is Maria’s go-to when she needs an energy boost and Easy Thai-Infused Coleslaw Salad represents a trip abroad that changed her whole way of thinking. Find recipes for fun homemade sauces and dressings, as well as naturally sweetened juices, snacks and treats to fuel your body and mind. By opening up about her battle with bulimia?with honest accounts from the ups and downs of recovery and advice on creating a healthy, meaningful relationship with food?Maria’s story is that of a hopeful, supportive friend. Her heartfelt stories and flavorful recipes will inspire confidence and joy in and out of the kitchen.